Most effigial monuments of the Early Modern period feature figures of the deceased carved in relief. However, some show them painted in two dimensions on stone tablets, wooden boards, canvas, or even painted directly on plaster on church walls. They appear to have been popular from the late sixteenth century and throughout the seventeenth, but few examples date from after 1800. Often these compositions mirror those shown on three-dimensional monuments. Perhaps they were regarded as a cheap alternative to more conventional monuments. 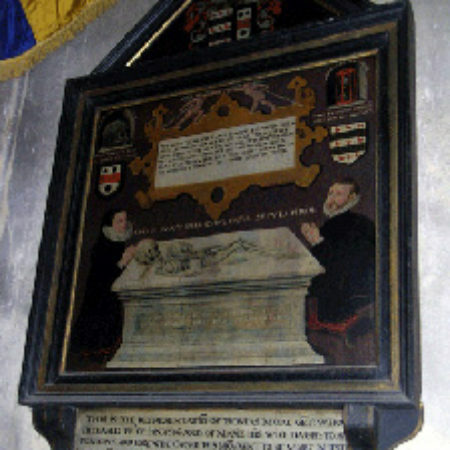 Our first ever monument of the month focuses on a modest framed wooden panel memorial at Adderbury (Oxfordshire). It commemorates Thomas More (d. 1586) with his widow Marie, who commissioned the monument. 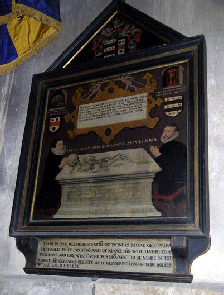 The inscription at the bottom says that she ‘caused this monument to be made in testimonie and certain beleefe of the resurrection of their bodies which are laied hereby’. It shows only Thomas and Marie, omitting any children that they had. The couple are shown kneeling at a tomb with a skeleton atop, representing Thomas in death. There is other memento mori imagery on the monument. Above Marie is a skull with the text ‘That larst I was is gone and past’ and above Thomas is an hourglass with the text ‘The fleeting stream not halfe so fast’. The iconography of this monument is not, however, concerned totally with death. The arms of the two families are shown above each figure and their impaled arms in the triangular panel atop the monument. It is clear that they wanted to draw attention to their armigerous status. no odds but time, we are, thow must be thus. Two parts of these verses merit particular attention, both regarding the lasting nature of funeral monuments. The part of the couplet ‘all tombes shal have their dying day’ refers to the death of monuments, a common theme in funerary verse. In the verses in the panel at the top the phrase ‘our sides were never brasses, our strength not stones’ seems to refer to more conventional monumental materials than were used for this painted memorial. The whole seems to point up the executors’ awareness of the ephemeral nature of the monument that they were commissioning.